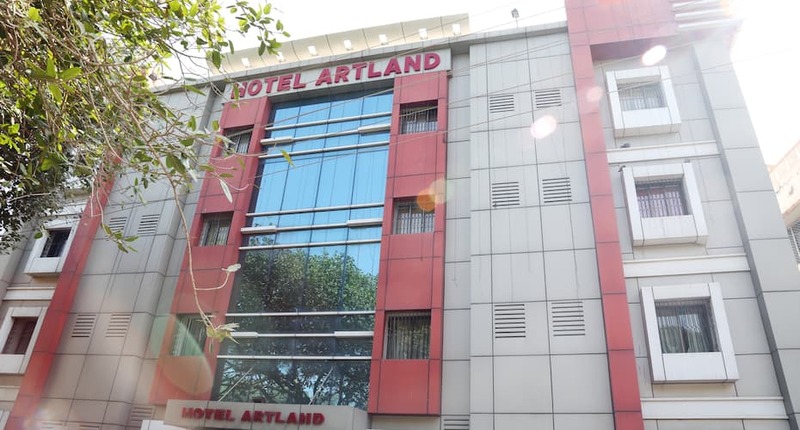 Providinga perfect accommodation in Digha, Hotel Artland features a water pool forchildren. This property is about 190 Km away from the Netaji Subhash ChandraBose International Airport. Thehotel houses 30 well-maintained rooms and suites possessing necessary amenities.Few of the conveniences in the rooms are television set, desk, and attachedbathroom with the facility of hot and cold running water. Massagefacility and business center are a few of the facilities present in the hotelpremises. It is inclusive of a multi-cuisine restaurant that serves a wideselection of delicacies. Fewof the transports that can be of help in reaching the property, include OldDigha Bus Stop (1 Km), Digha Flag Station (0.5 Km) and Tourist Bus Station (4 Km).A stay at Hotel Artland can be accompanied with various tourist spots,including Amarabati Park (3 Km), Digha Science Center (4 Km) and MarineAquarium (1 Km). Hotel is placed near to sea beach at Old Digha. Rooms are clean & good. But the food is bit costly and not upto the mark. Prior reservation recommended. We enjoyed our stay here at Old Digha. Hotel does not have wi-fi network. The hotel is good for stay at reasonable price. But inside the hotel there are no network inside their hotel rooms. Wifi is available only in reception area. The location is barrister colony and it is situated just beside Sea Hawk. Car parking facility also available. Now their food; food is just unbearable. If you want to stay a network less day then it's perfect but don't eat there to enjoy your stay. We 3 friends visited digha last week & checked in. They don' t ve 3 bedded room instead will urge upon extended 2 bedded room as 3 in 1. The service & response of the person at the reception is pathetic. Even the staffs r not quick at service. Food is ok compared to price. The hotel has check out time at 1000 hrs which is awful. The rooms r not cleaned & linens r not changed regularly. I' ll not recommend it. We stayed in this hotel in June for two nights. We were allotted room no. 305 on the second floor. It was a AC room. Here is my feedback : Pros : 1. The hotel is at a very good location in Barrister Colony in Old Digha. The flat beach is hardly 5 minute walk. 2. Room was quite big and spacious with nice interiors. It was neat and tidy including the bathroom. 3. There was no disturbance of any kind. Very peaceful. 4. Its restaurant food is reasonably priced and quite tasty. Cons : 1. Poor room service. Bed sheet was not changed in spite of reminders. 2. No balcony. 3. No sea view. 4. No internet access. 5. No garden/playing area. If you are planning for a short trip to just relax, you can stay in this hotel. It will not burn your pocket. This is a review of the restaurant of this hotel and not the hotel where I have not stayed even once. I visit the restaurant of this hotel on the ground floor every time I have visited Digha in the recent past and the reason is that the restaurant offers excellent Bengali food not only which excels in quality but also in taste. This January we visited here on one afternoon while on our way back to Kolkata from Mandarmani and the train was at 330 so we decided to have the lunch here. The Pomfret Masala and Crab Masala were an awesome thing to taste. In one of my earlier visits I had also tried the Pomfret Fry and it was awesome as well. But one thing I cannot miss to mention, we were about to leave when he asked for the feedback, I said it was nice but to my surprise he replied that he was sorry that the stock was 5 days old, I was in a hurry to go to the station but could not help appreciate his honesty, though things tasted superb as usual. Go for rooms on the second, third and fourth floors as they are quieter. 3rd or 4th floor sea view.